Now that I'm finally done writing about my fabulous trip to NYC, I can get back to what this blog is really about: local St. Paul/Minneapolis theater. Last week I saw the brilliant play August: Osage County at the Park Square Theatre, a great little space in downtown St. Paul. I've attended a handful of their shows over the years, and a few things this season intrigued me. One is their upcoming production of the musical Ragtime (featuring a fabulous cast of local musical theater actors), which I saw ages ago on tour and loved. The other is the bitingly funny and tragic play August: Osage County, which I also saw on tour. I remember laughing and cringing at the life of the dysfunctional Weston family, and those feelings continued with this production of what has become an American classic. The dysfunction starts with the parents Beverly and Violet, he's an alcoholic and she's addicted to pills, and continues through their three adult daughters. Barbara left home long ago to work and raise a family, Karen has been wandering and searching for happiness and thinks she's found it, and Ivy has stayed close to home, perhaps too close. But none of them have been able to escape the pull of the family, and come home in response to an unexpected tragedy. Violet's sister and her family also show up to add more layers of dysfunction. The outside observer to all of this is Johnna, a young woman who has been hired to take care of Violet as she goes through treatment for cancer. Through her we observe this family like a fly on the wall. The set is spectacular (designed by Michael Hoover). An entire house sits on stage with the front wall removed, like a life-sized doll house. We're able to see into every room, even the kitchen stocked with appliances, spices, dishes, and food. It feels like a house that's lived in and witnessed countless family dramas. I can't say enough about this cast of mostly local actors, starting with Barbara Kingsley as family matriarch Violet. She understudied the role on Broadway and on the first national tour, but never got the chance to play the role. She's got her chance now, and the months she spent living with the Westons is evident in her portrayal. At times incomprehensible as a drugged-up Violet, at times cruelly honest and in control, Violet is a fascinating character that I alternately sympathized with and despised. Barbara's real-life husband Stephen D'Ambrose plays Violet's husband Beverly, whose brief appearance at the beginning of the play is so affecting it hangs over the rest of the play. The Weston girls look and act like family. Virginia S. Burke is particularly good as Barbara, as she slowly starts unraveling while trying to deal with her family. She even looks like Violet; you can see her transforming into her mother even as she tries to resist it. Kate Eifrig (who will always be My Fair Lady to me) is Karen, who proudly shows off her fiance (who, it turns out, is no prince), and Carolyn Pool completes the trio as Ivy, who's found love in an unusual place. Karen Landry is funny and entertaining as the meddling Aunt Fannie Mae. Her sweet suffering husband, Uncle Charlie, looked familiar, like ... that guy on TV. It turns out Chris Mulkey (a native Midwesterner who now lives in L.A.) has been on countless TV shows (including two of my favorite shows of the last year - Justified and Boardwalk Empire). Each character in this play is complex and layered, which makes it fascinating to watch. This is my second three act, two intermission, loooong play I've attended this month. Even though it wreaks havoc on my sleep patterns, it's great theater. It's a pleasure to be that immersed in a story and characters for that long. I extended the evening even longer by staying for the post-show talk-back with the actors and director Leah Cooper; this is one of those plays that will get you thinking and talking for days. 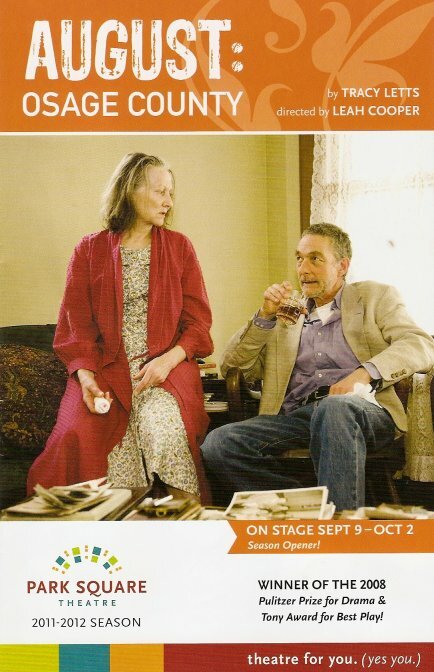 August: Osage County runs through the first weekend of October, check it out if you want to be challenged, entertained, and maybe even a little bit disturbed. Absolutely agree with you that this is a terrific production... Everyone was spot-on and I also saw the Estelle Parsons touring production of AUGUST. Kingsley matches Parsons in all ways.